This is an extremely rare dinosaur claw. 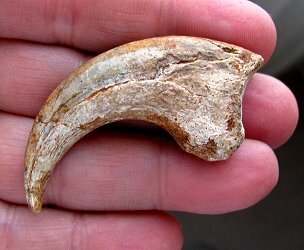 It is a beautiful Velociraptor mongoliensis Hand Claw from Mongolia. This specimen was acquired from a major dinosaur fossil collection. The fossil has extremely fine detail preserved - the bone quality and distinct features are very easily seen. The claw has great shape and form, and the curve to the claw is quite pronounced and very impressive. And the claw has absolutely no restroration whatsoever! This is a top quality Velociraptor Hand Claw from the Gobi Desert - it doesn't get any better than this!